Twenty-five years ago, Gwen Nicholson-Nelson was in a car accident that almost claimed her life and left behind a strange gift. She can see the future...and death...before it comes to pass. She had a vision of her husband's death ten years before it happened in, for Gwen, chilling deja vu. During this time, she's also had a disturbing connection with another like her, a psychic who has the power to not only see into others but to manipulate and destroy. For twenty-five years, as seemingly unrelated events convince Gwen she has no power of her own beyond bizarre sight, she's wondered why she was given the ability to see pain and death yet never to alleviate them. But when her nemesis targets Dylan Mitchell, the man she loves, and his daughter, all the pieces of the puzzle that have tormented her fall into place. Gwen must discover her own power, believe in herself and her destiny, and act--before her vision of Dylan's death comes to pass. Imagine you had a gift or curse that let you see the future, the past; the death of a loved one or an evil presence. Would it change you? That is what Gwen has been given. Imagine one night in the midst of your greatest despair you find salvation in the arms of a stranger, the answer to questions you’ve asked yourself forever, gave you a glimpse of what love could be. Would it guide you? Would you reach for it? Forever? That’s what Dylan asks himself. 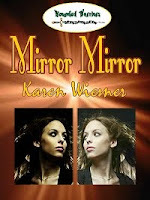 Ms. Wiesner cleverly crafted this psychological thriller where evil abounds but is hidden. We readers are given a haunting, heart-wrenching tale by an author so gifted with words, that I was moved to feel the pain and anguish of her characters -- characters who were so real, so powerful, so well developed that they lifted off the pages with movie-like effects in this reader's mind. The supporting characters added depth to the story without detracting from the hero and heroine. The author penned flowing dialogue that helped me understand and empathize with her characters, her heroine's "vision" scenes left me gasping on the edge of my seat with their daunting clarity. Her love scenes were hot and sensual and so filled with love they made me cry with the characters. This amazing read will enthrall any reader who loves heart-stopping psychic thrillers and who enjoys a great love story with wonderful three dimensional characters. Readers who like melded family drama pieces with enough teenaged angst to give parents the cold sweats and readers who like the heat turned way up on their romances will want to give this story a read.